Moroccan cuisine reflects the influence of Africa, the Middle East, India, China and Malaysia. The Moroccan people also rely on Spanish, Portuguese and French foods and customs to shape their cuisine. The customs and rituals surrounding food are just as important as the cuisine. Certain religious directives shape the food choices of Moroccan people. For example, pork is forbidden. People in Morocco also don't eat meat that hasn't been sacrificed, a practice called kosher in the Jewish tradition and halal in the Muslim religion. Other foods are eaten as part of religious rituals, such as the harira eaten to break the fast each evening of the holy month of Ramadan. Pastries are another common food eaten on evenings during Ramadan. Lunch, called rada, is the main meal in Morocco so it's also the largest and often includes several courses, according to Raphael Chijioke Njoku, author of "Culture and Customs of Morocco." Most families eat the midday meal at home together before going back to work. The meal starts with green vegetables or salads called tapas, which are followed by tajine, a stew or soup. Hard-boiled eggs, bread, lamb or chicken and couscous are common parts of a Moroccan lunch as well. Breakfast, called futo, usually includes bread, jam, butter and olives, and dinner, called asha, is usually leftovers from lunch. In the Moroccan culture, many people believe in "Al Baraka," which refers to a type of spiritual energy that occurs when families join together to eat, according to a 2013 article published in "Morocco World News." This means that some Moroccans eat collectively, even going so far as to share food from common bowls. 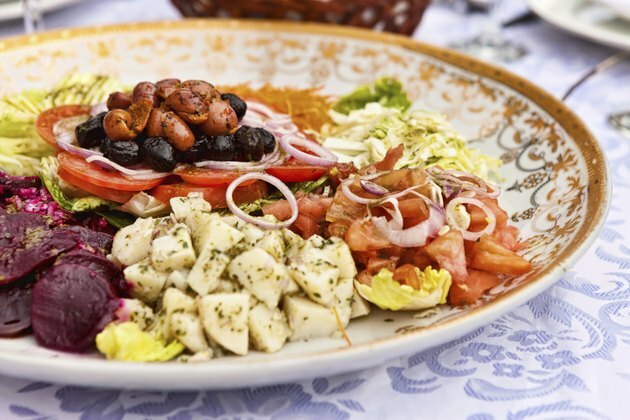 While some people in Morocco dish food onto individual plates from a bowl placed on the table, it's part of the eating culture for everyone to take bites from the same dish without placing it on a plate. One of the most commonly eaten foods in Morocco is couscous, a grain made from semolina, barley, millet or cornmeal. Couscous is served for at least one meal, usually lunch, each day. Bisteeya, a type of pastry similar to pie, is also common. Roasted lamb and a chicken dish made with lemon and olives called djej emshmel are staples. Bread, nuts, olives, onions, garlic, potatoes, tomatoes, peppers, squash and fruit are also important components of Moroccan cuisine. Morocco World News: Eating From the Same Dish: Respectful or Immoral?